Seeing a musical is always an amazing experience, but nothing compares to watching a show on Broadway. It’s almost unimaginable that someone would travel to New York City and not take in a show in the heart of the American theatre industry. One of the many coveted tiyul options this year was the New York City theatre trip. With elements of Shakespeare’s classic Romeo and Juliet and Disney’s, The Little Mermaid, Once on this Island was unlike any Broadway show that I have ever seen. The revived 1990 show opened on Broadway on December third. As soon as I entered the theatre and caught a glimpse of the tiny round stage that transformed back and forth from a small island to a fancy hotel, I knew it would be a special show. The show’s star-crossed lovers do not represent Shakespeare’s “two households both alike in dignity,” but rather, as the opening number puts it, “two different worlds on one island.” Everything about the show is authentic, such as the traditional Caribbean dances that can be seen in hip hop performances today; the songs are incredibly uplifting and the colors are as vibrant as they come. I had never heard of this show before, but it was also something that I never would have expected: a musical about what happened to the planes that were redirected to Newfoundland, Canada on September 11, 2001. Instead of being dark and heartbreaking, the musical displayed the hospitality shown by the Newfoundlanders towards the Americans when their aircraft was diverted to Newfoundland in the middle of chaos. Even though the cast was enormous, each actor took on multiple roles. This made it difficult to keep up at times, but nevertheless, the musical is entertaining and comedic. The music was lively and the cast was extremely talented, but I would not see it again. With no doubt, this show has something for everyone and was hands down my favorite show. The storyline is heartfelt, unpredictable, and relatable. The music is great and catchy (I’m currently playing the soundtrack as I write) and the actors’ performances are amazing. The use of staging, lighting, and effects is extremely unique. The show centers around an anxious teenage boy, Evan Hansen, who struggles to make connections with his peers, and feels neglected and isolated from the world. He fabricates a relationship with a deceased student who committed suicide. In a misguided attempt to comfort the boy’s grieving family, Evan pretends that he was actually good friends with their son. In the end, the message that no one is alone is extremely relatable for everyone, especially teens. The show made me cry out of laughter and out of sadness. This was the show that I was most excited for, having seen this movie about thirty times, and it did not disappoint. 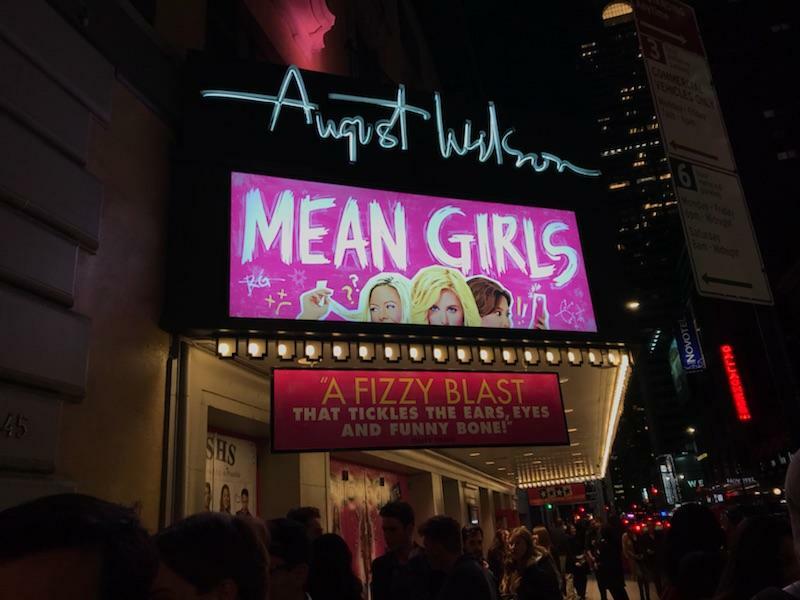 Before seeing this show, I would highly recommend watching the movie first, so that you fully understand why so many people will die of laughter when Damian says, “You go Glen Coco.” I literally came into the show in all pink (another movie reference) along with many other showgoers. The musical centers around a teenager, Cady Heron, who has been homeschooled her entire life in Africa and attracts the attention of “The Plastics” or the most popular/meanest girls in school. After head of “The Plastics,” Regina George, betrays her, Cady is astonished that girls can be just as brutal as the tigers in the wilderness from whence she came, so she along with her best friends, Janis and Damian plan to sabotage Regina, so that Cady can get her dream guy, Aaron Samuels. Janis and Damian narrate the musical, which includes most of the classic lines in the movie. The musical focuses a lot more on feminism than the movie, emphasizing female empowerment, which had the ladies in the theatre roaring. Outside, merchandise was being sold with the most famous lines from the show, such as “You can’t sit with us” or “fetch.” So, if you are as in love with the movie as I am, then you should definitely see this one. I think it is more than safe to say that this musical was quite interesting and intentionally very different from anything else on Broadway. It began and ended with the line, “A long time ago, an Egyptian band came to Israel; it wasn’t very important.” This line basically sums up the entire show. In short, the show centers around an Egyptian band landing in Israel, and during the trip, the lead meets an Israeli woman and they spend a little bit of time with each other, but their relationship never really gets anywhere and it ends with them saying farewell. To me, it was pretty fruitless, which was obviously the intention. This made it humorous, but it was a very slow performance for the most part that made it hard to stay completely focused. Also, some lines were spoken in Arabic and Hebrew, with no translation, which was frustrating at times. The highlight of this musical, in my opinion, was the beautiful Arabian music played by the Egyptian band.